As societies gather increasing amounts of data, interest is growing in technology that allows people to explore and analyse it. The process used, known as data mining, offers many potential benefits. In the pharmaceutical field, for example, it can help medical researchers to discover correlations between illnesses and treatments, as well as improve diagnostics, aid understanding of multifactorial diseases, and repurpose existing drugs. Law enforcement agencies can use data mining to spot patterns in the times and dates that crimes are committed, helping them to allocate resources more effectively and prevent crimes from being committed in first place. But questions remain about the legal framework that governs the use of data mining. In particular, do UK and EU copyright rules and the sui generis database right law impede the use of DM? These questions are important, because evidence suggests that when it comes to data mining, Europe is lagging behind the US and a number of Asian countries. One reason for this is that copyright protection in EU and European Economic Area countries is relatively strong, which has a negative net effect on the use of data mining. This paper considers how the relationship between UK and EU copyright and database law and data mining affects three important industries: the pharmaceutical sector, law enforcement and marketing. It concludes that data mining is prima facie infringing. The legal exception and defences currently available are at best insufficient and at worst not applicable to data mining. Such legal uncertainty is likely to have a chilling effect on data mining in Europe. The paper concludes by considering potential legislative and regulatory solutions to ensure that data miners in Europe are able to achieve the potential benefits that data mining offers. One potential solution is for copyright owners to grant researchers licences to mine their data. In addition to the cost and scalability challenges of obtaining licences, however, there is a risk that a licensing-based solution could be used to erode copyright rules and exceptions. Another potential solution would be to introduce a wide, US-style fair use exception to copyright law. This has the advantage of being able to deal with emerging technological developments and is thus relatively “future-proof”. However, many European legal scholars and lawmakers are likely to resist a wholesale import of US-style fair use provisions. Policy makers may be more amenable to a compromise approach, similar to that proposed by the Irish Copyright Review Committee, which recommended combining UK-style fair dealing and closed exceptions with fair use. Given that Europe is falling behind in the crucial technology of data mining, it is in Europe’s competitive interest for policy makers to err on the side of openness, even if fair use provisions seems out of reach. A closed, mandatory, data mining-specific exception rather than a technology-neutral, future-proof solution seems to be the most likely outcome of the latest round of EU copyright reform. Whatever the Commission proposes, it is crucial that policy makers are pushed as far as possible in the direction of openness and legal certainty to maximise the gains for data mining in Europe. 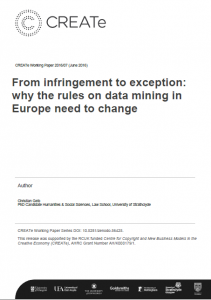 Download From infringement to exception: why the rules on data mining in Europe need to change.